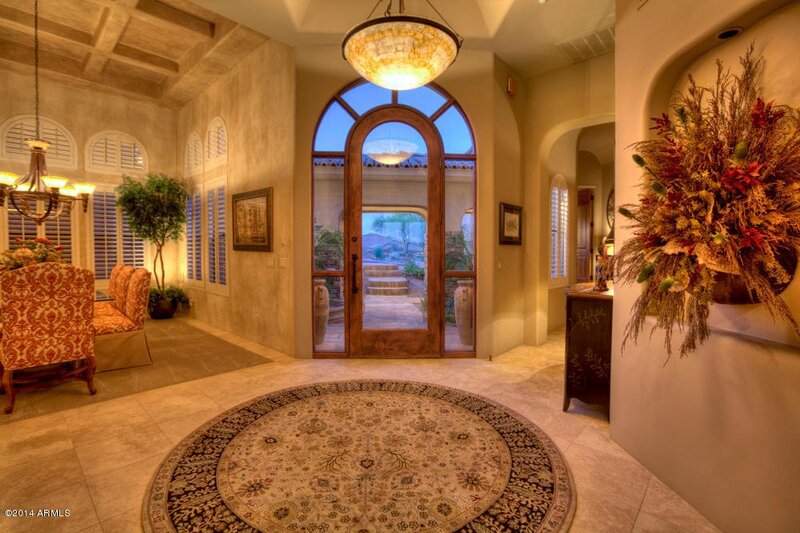 The Old World charm of this elegant single-level home will captivate you as soon as you walk through the serene courtyard with bubbling water fountain. 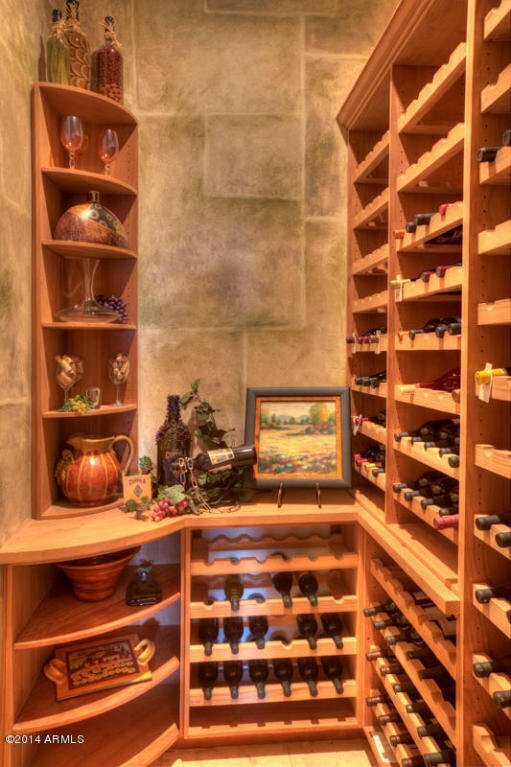 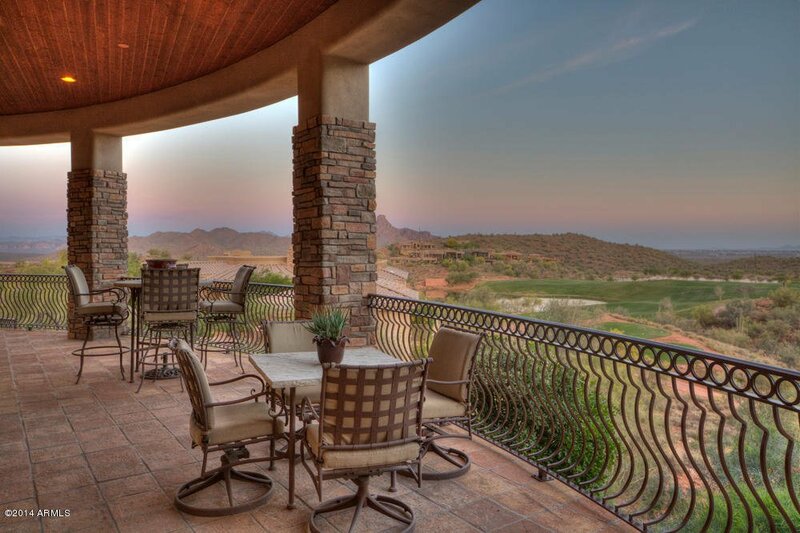 Select a special vintage from the refrigerated wine closet & head out to the large wrap around patio to take-in some of the best views in all of FireRock. 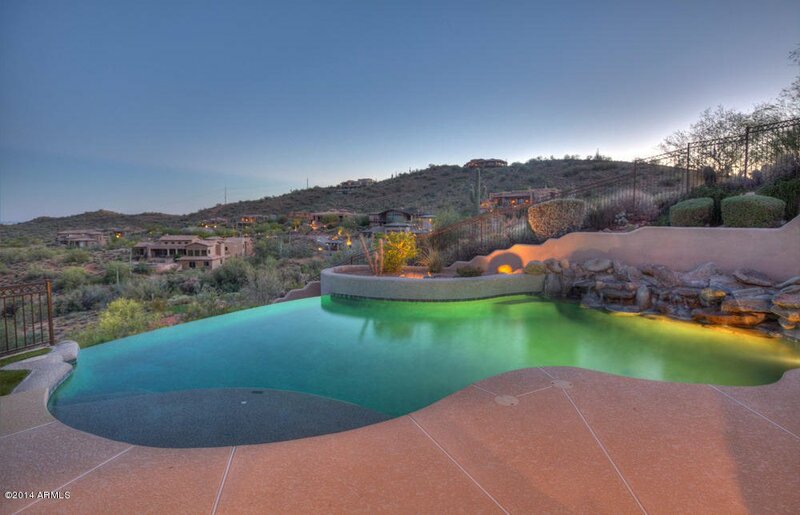 Relax in your spa in front of the fireplace or take a dip in your heated infinity-edge pool with its own fireplace & outdoor shower. 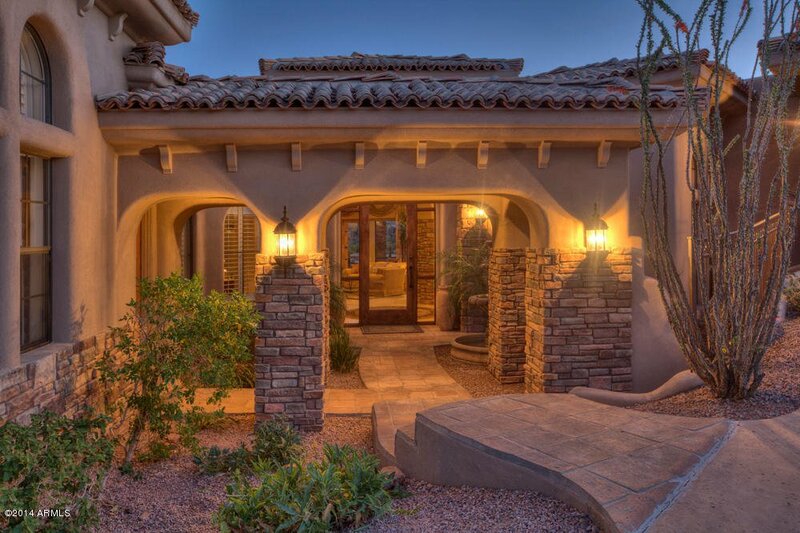 Inside the home you will appreciate the gorgeous custom ceilings, high quality finishes throughout & spacious rooms designed with sweeping views or privacy in mind. 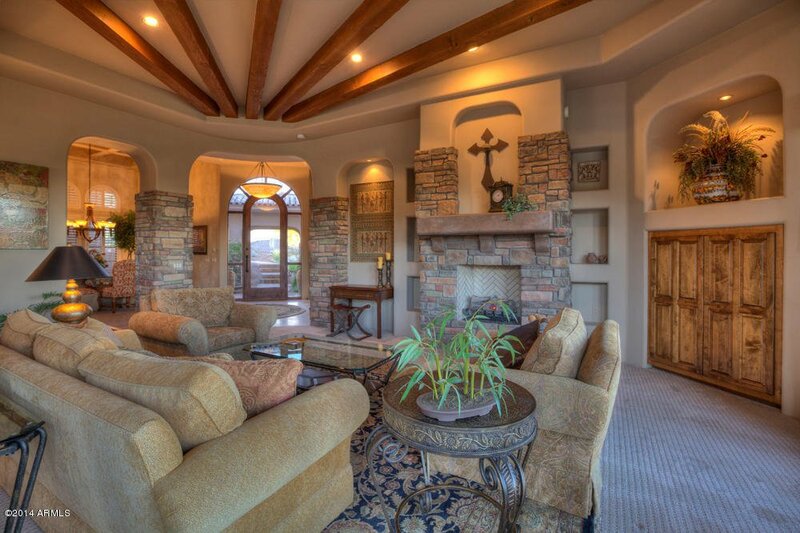 Enjoy casual or formal entertaining with the flowing, open floorplan. 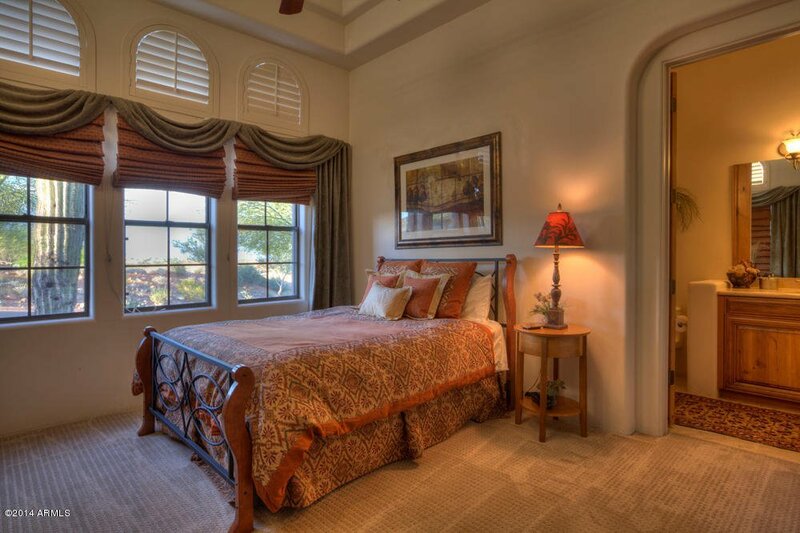 2 ensuite bedrooms are available for guests. 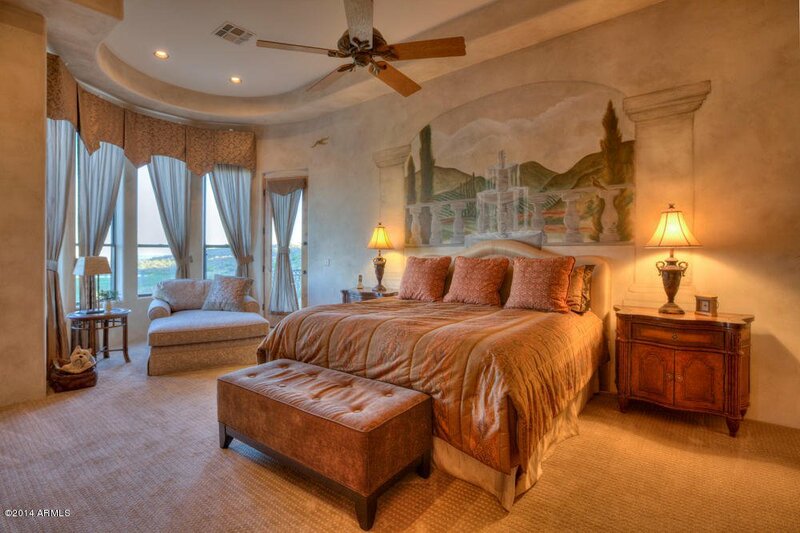 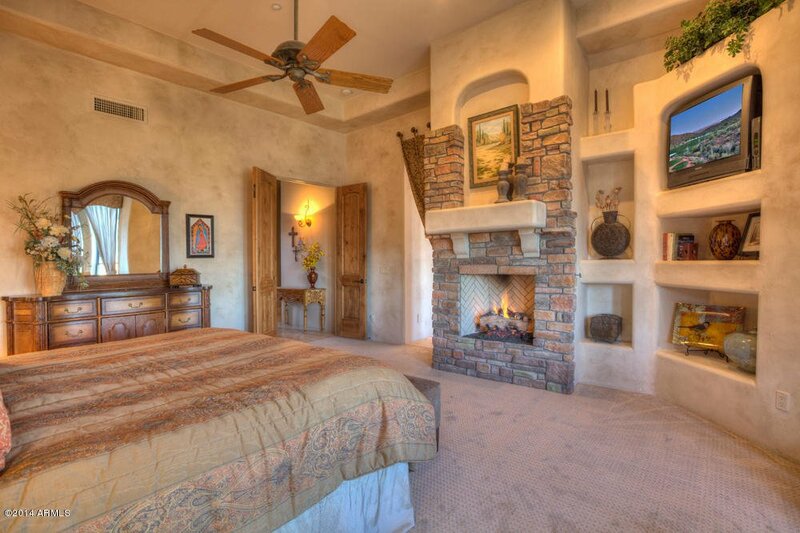 You can unwind in your luxurious master suite with gas fireplace & sitting area. 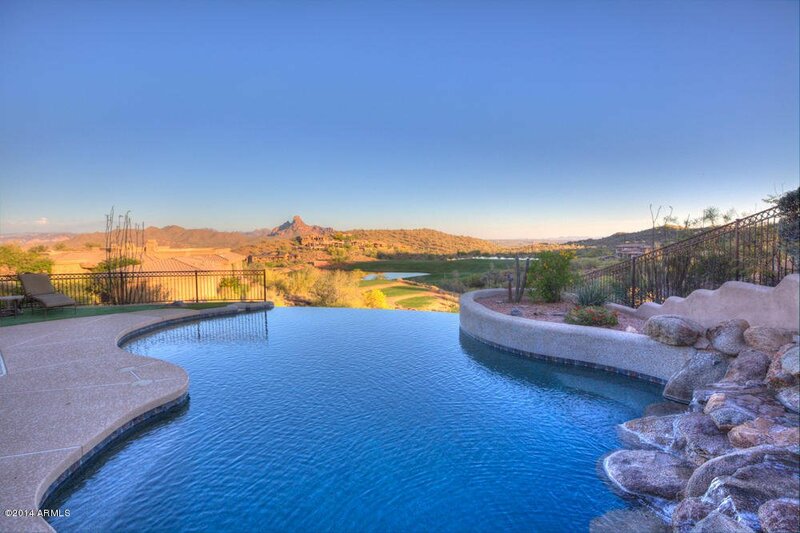 Detailed Write-Up for 15817 E Firerock Country Club Dr, Fountain Hills, AZ 85268: Enjoy breathtaking mountain, golf course & city lights views from this elegant custom home with 3 split ensuite bedrooms plus a study, 3 full baths & 2 half baths in guard gated Firerock Country Club. 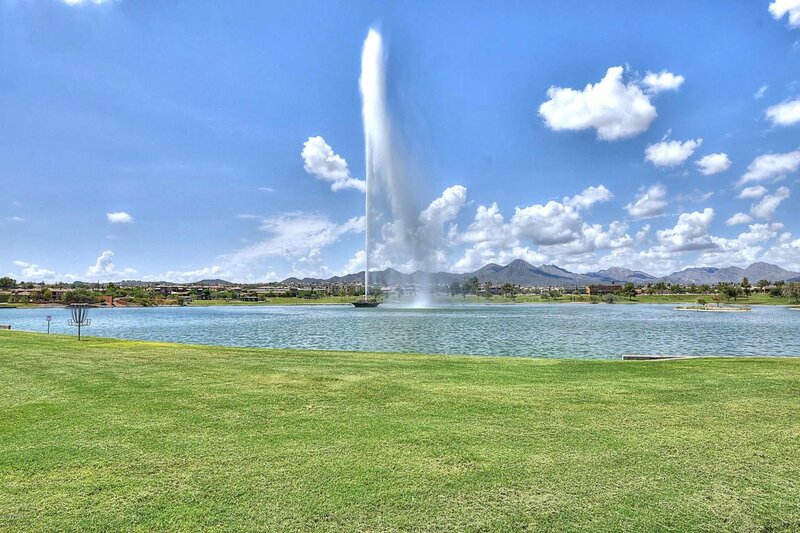 The address is 15817 E Firerock Country Club Dr, Fountain Hills, AZ 85268. 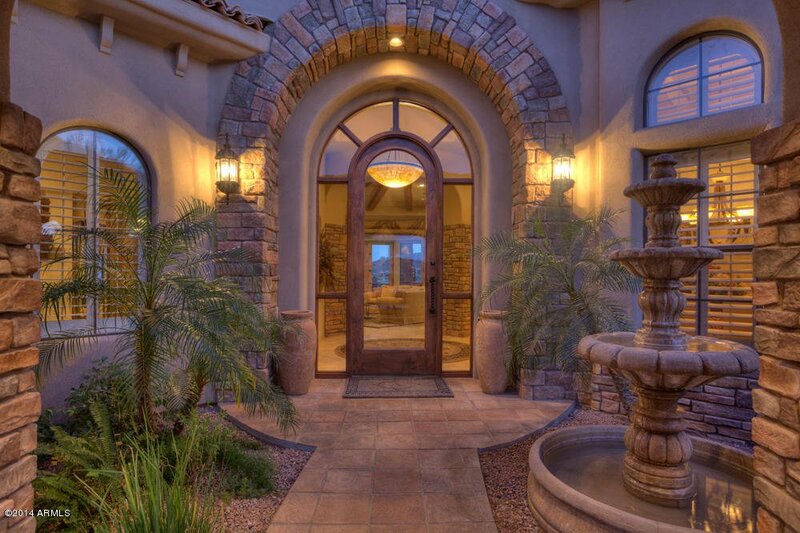 The courtyard with a bubbling water fountain leads you to an inviting Tuscan home where each spacious room has been carefully thought out with sweeping views or privacy in mind. 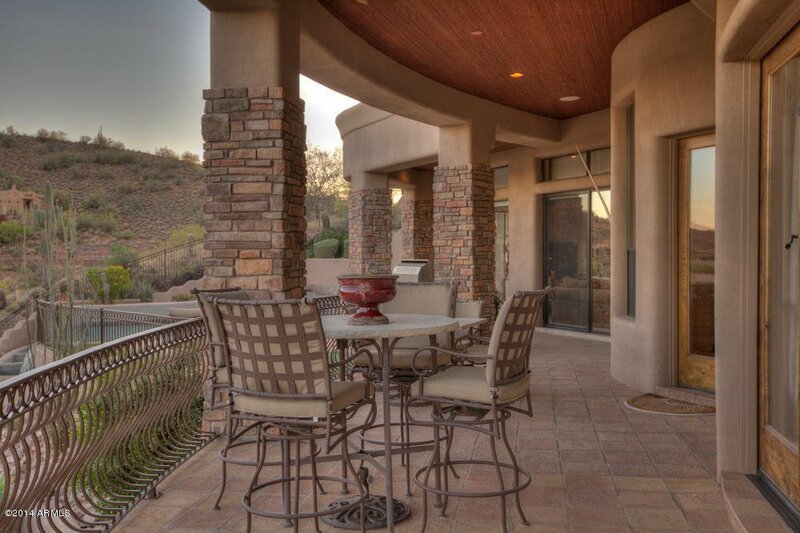 You will love the gorgeous custom designed ceilings, beautiful high quality travertine & granite finishes, custom window treatments, custom cabinetry, and custom built-ins throughout. 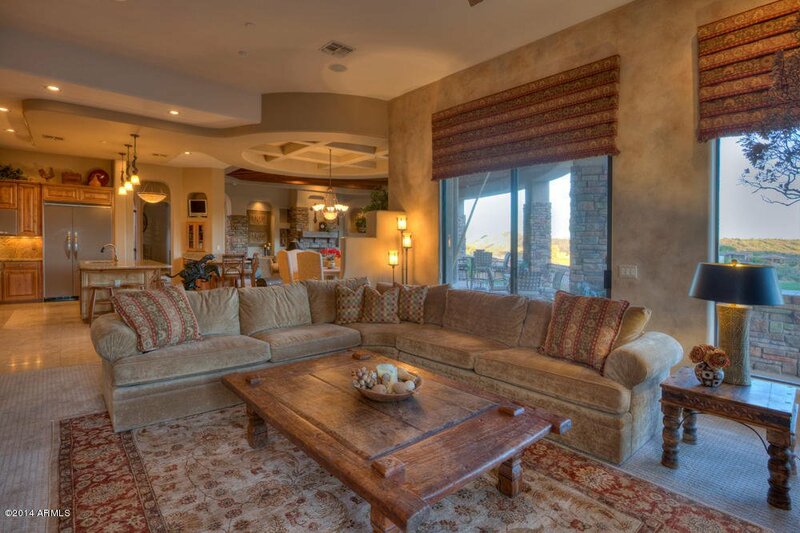 You and your guests will be wowed with the incredible views from the wall of windows in the very open great room which encompasses the living room, family room and eat-in kitchen. 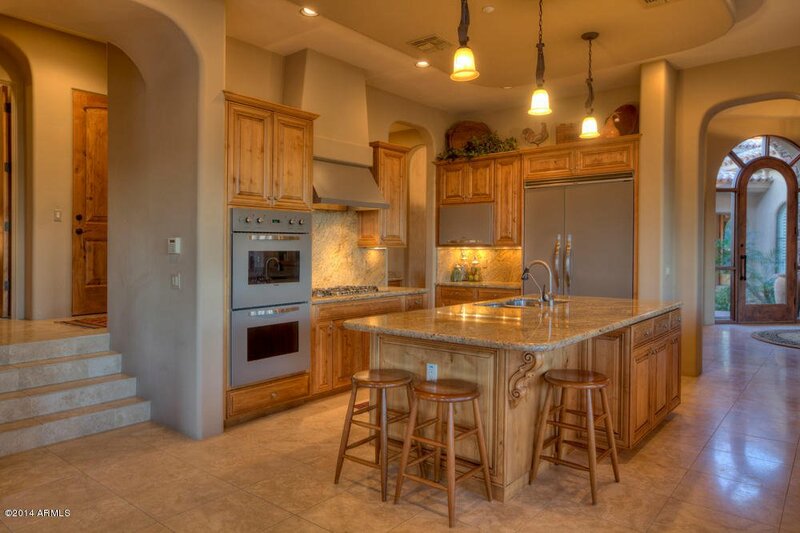 Entertaining is easy with your wet bar with its hammered metal sink, high-end kitchen appliances with their stylish gunmetal gray Viking covers, 5-burner gas cook top, and large kitchen island with slab granite countertop & built-in wine cooler. 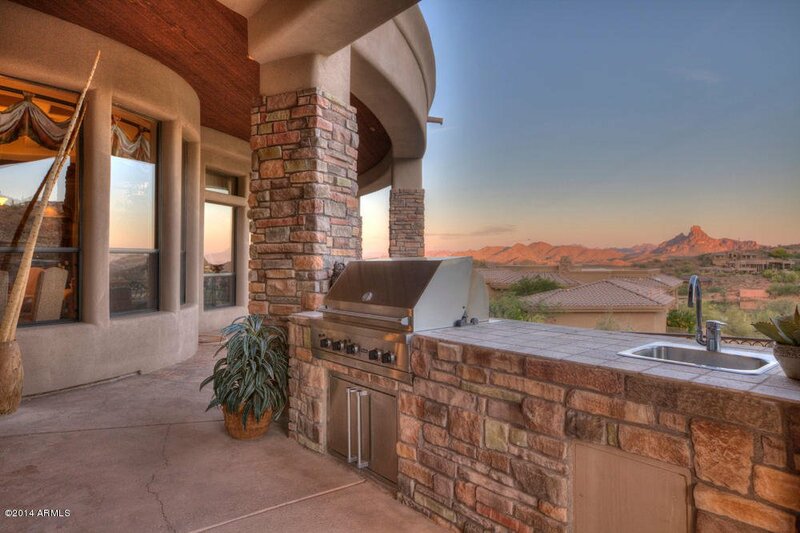 Bring your guests outside to the spacious reverse Saltillo tile wrap-around patio with a wood paneled ceiling, sound system, outdoor kitchen with built-in BBQ & sink, 2 gas fireplaces, an outdoor shower & separate powder room, motorized awning, and amazing postcard-perfect views. 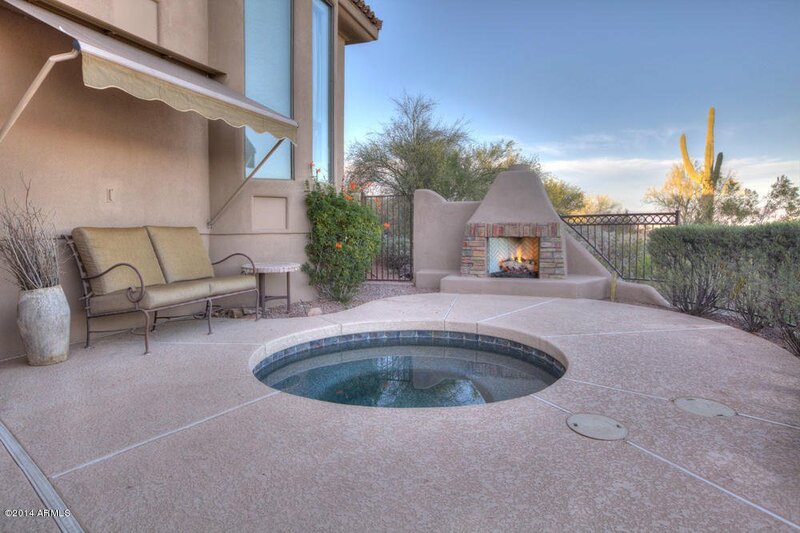 Gaze at the scenery while you soak in your private heated spa with a fireplace at one end of the patio or in your heated negative-edge salt water pool with a fireplace at the other end of the patio. 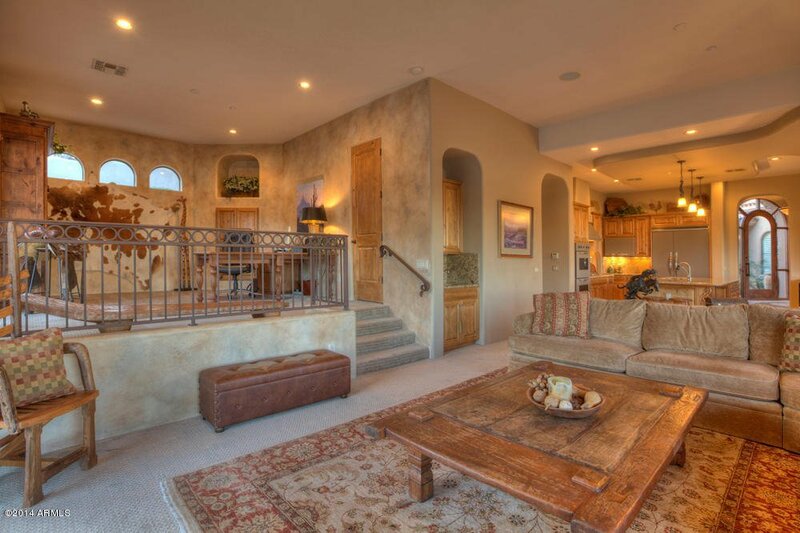 Enjoy more entertaining in the casual family room with its wet bar & TV area, in the living room with its lovely gas fireplace, or in the formal dining room with a butler's pantry and a refrigerated wine closet with a scrolled wrought iron door. 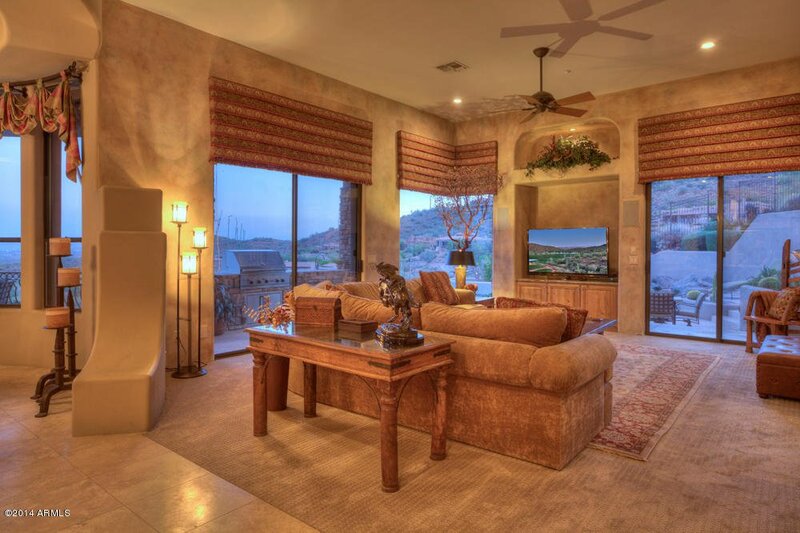 After all that entertaining you will want to relax in your luxurious master suite with a gas fireplace and sitting area with views. 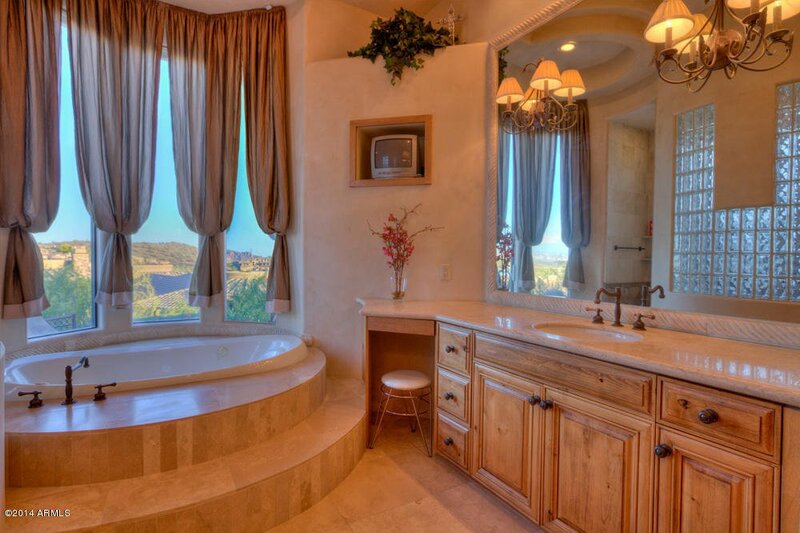 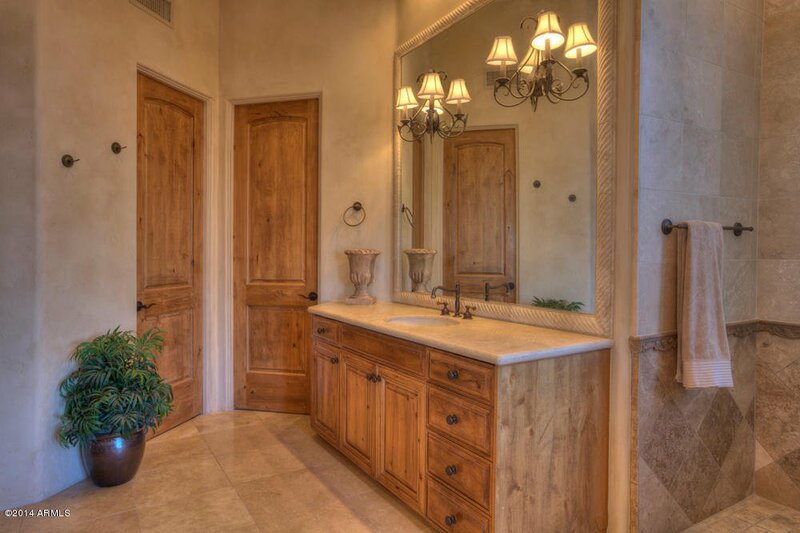 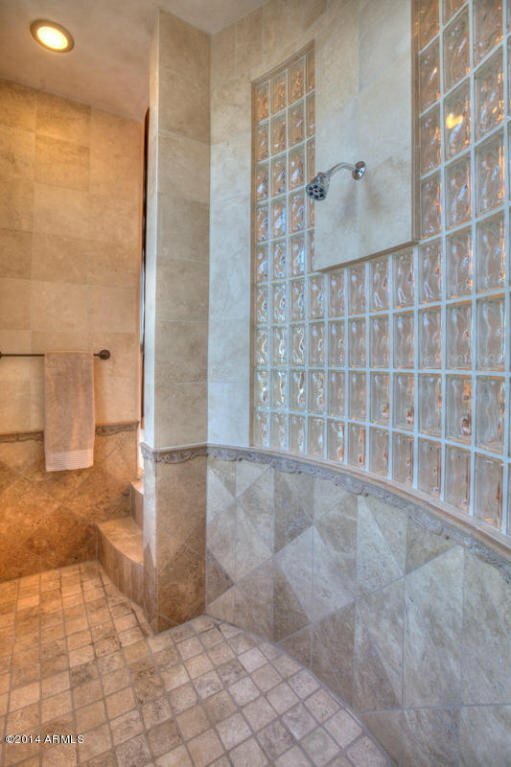 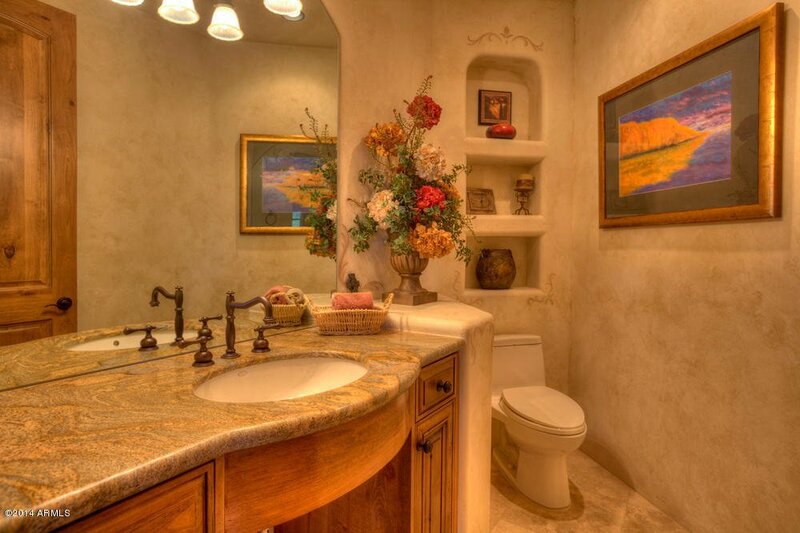 The travertine tiled master bath has dual vanities, a jetted soaking tub with views, a travertine & glass block walk-in dual-headed shower, and a large walk-in closet. 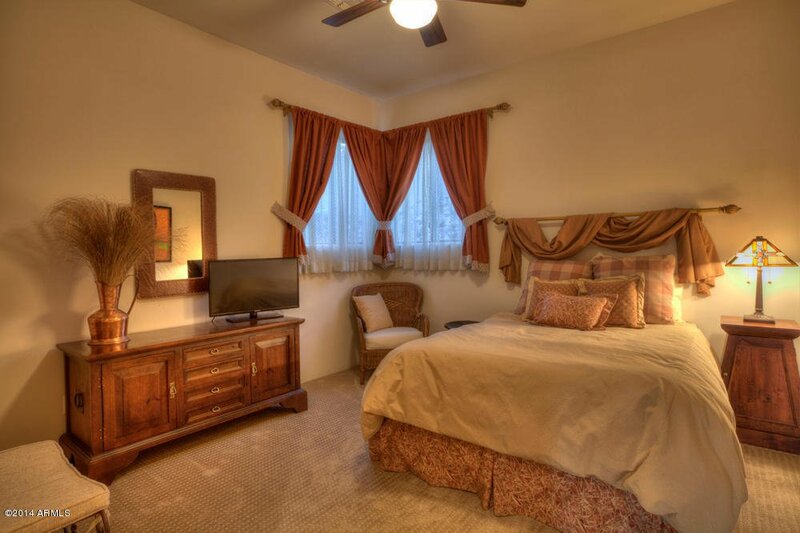 One of the lovely guest rooms has its own exit to the courtyard. 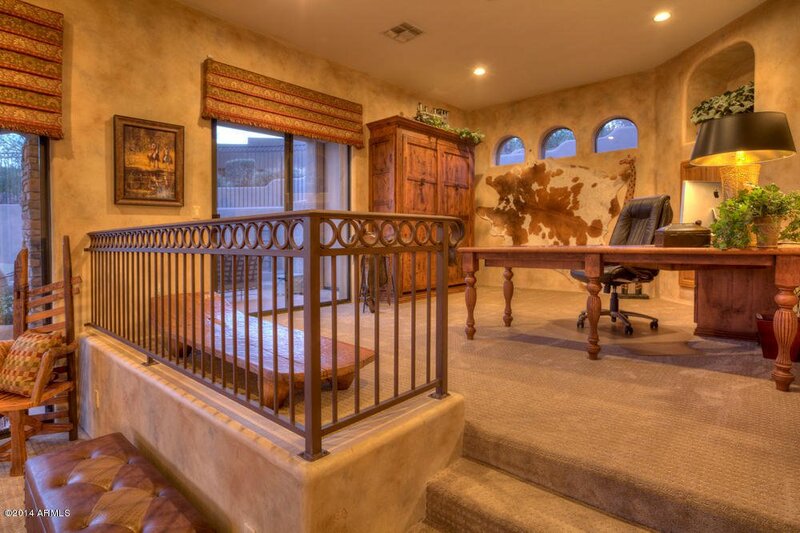 The study is open to the family room with views and has clerestory windows, a convenient closet & built-ins. 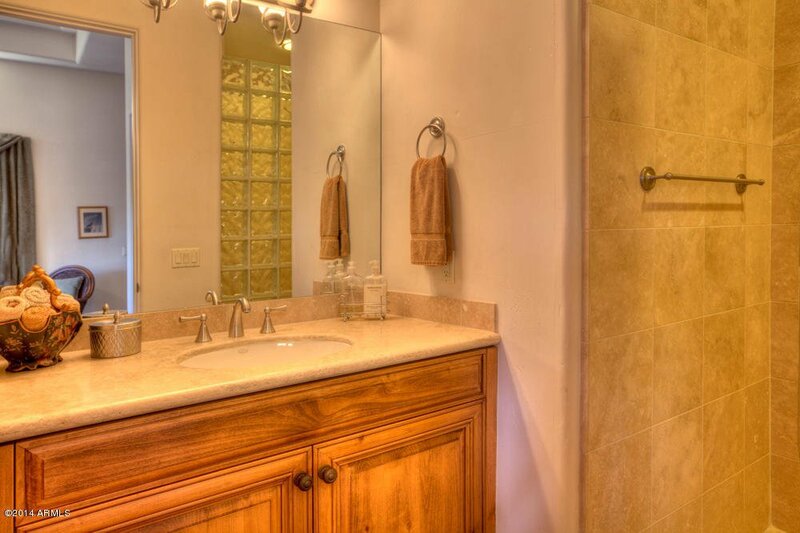 The laundry room has a Fisher Paykel washer & dryer, travertine tile counter top, custom cabinetry, and a stainless sink. 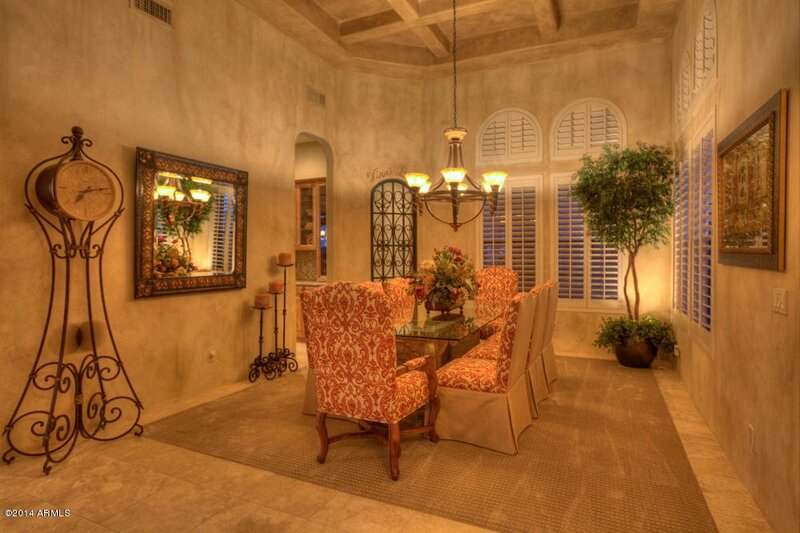 Most furnishings are included with an acceptable offer or can be purchased with a separate bill of sale. 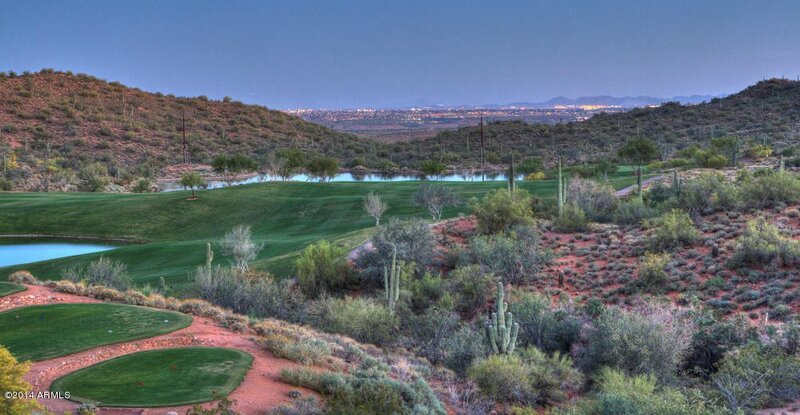 The seller has a Firerock golf membership, which can be transferred with an acceptable offer or purchased separately. 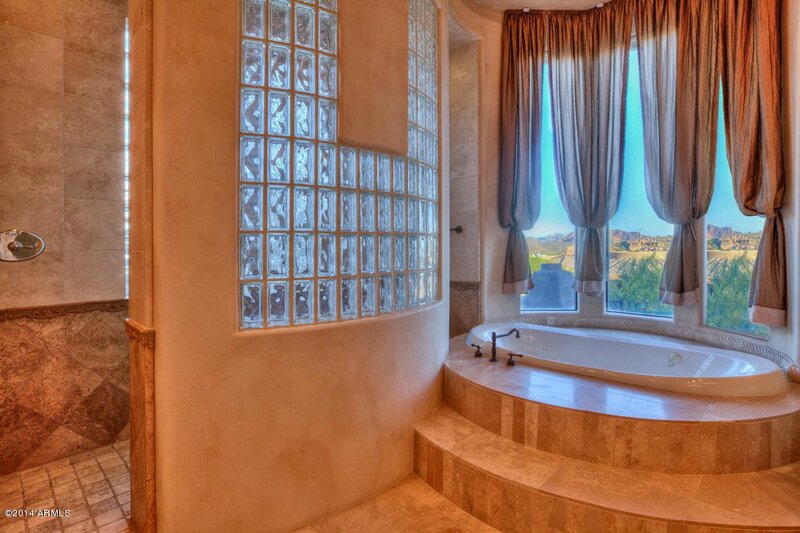 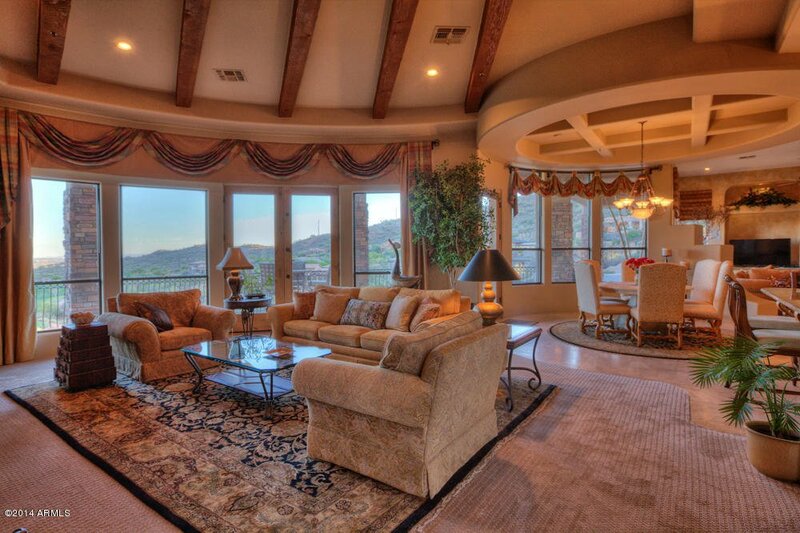 This fantastic home is located in a great town known for its fresh air, gorgeous views, and world-class golf & tennis. 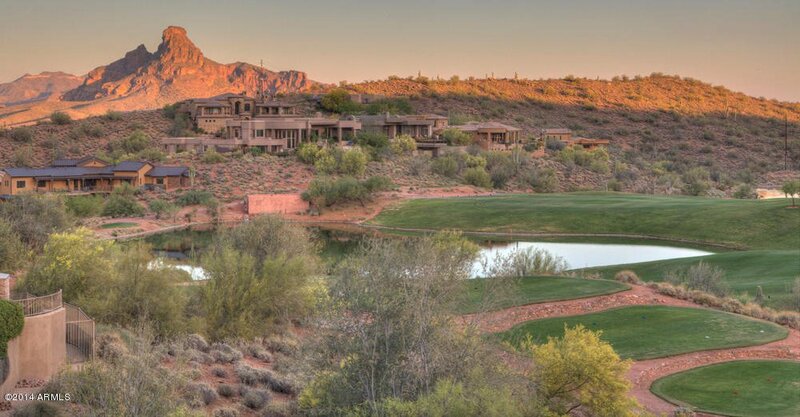 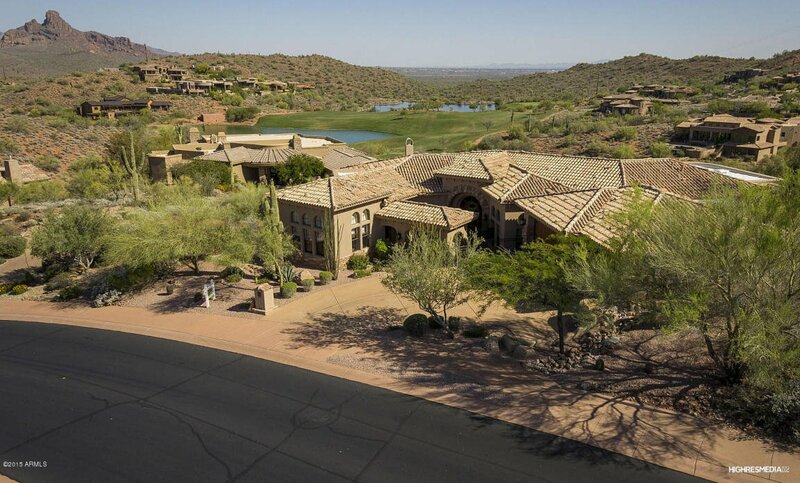 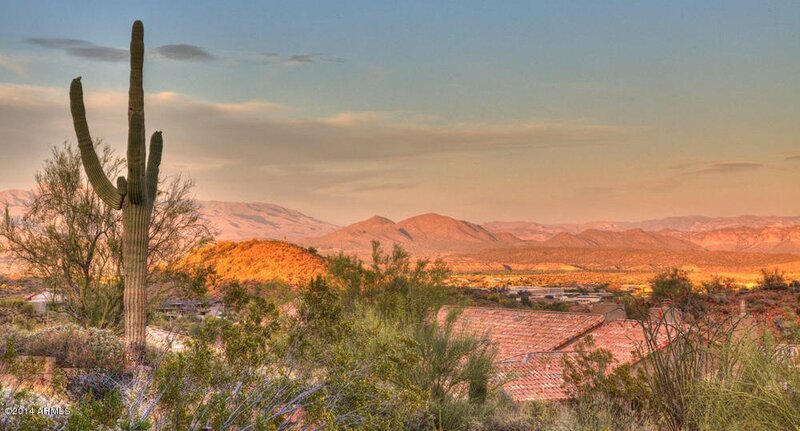 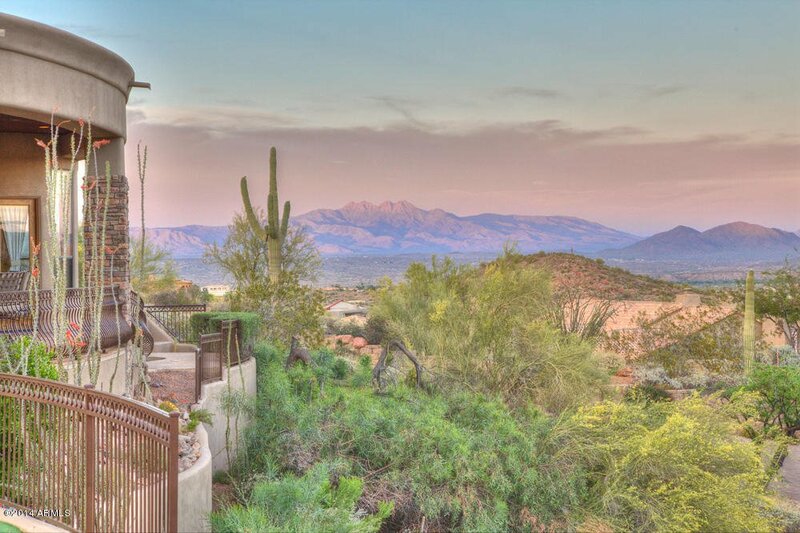 Outdoor recreation areas are just a short drive away, as are popular areas of Scottsdale. 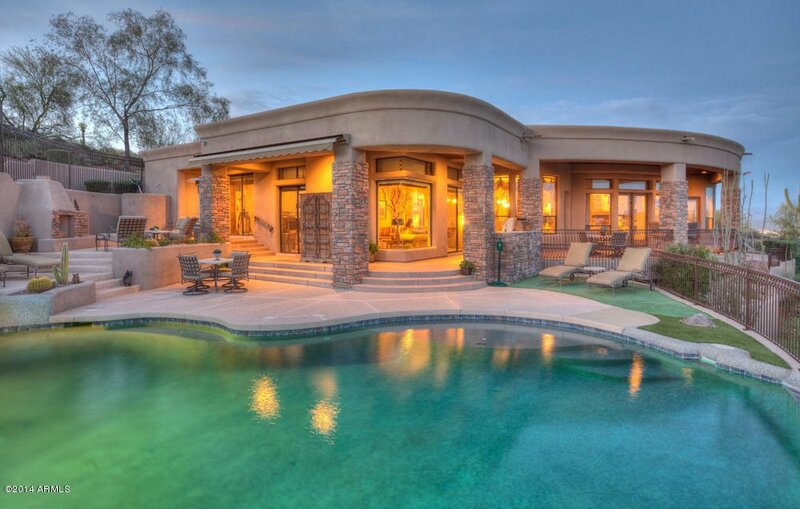 The home's other special features include a 3 car garage with epoxy flooring, north/south exposure, gas heat, gas hot water heater, multi-zone heating & cooling, central vacuum, fire sprinklers, water softener, reverse osmosis, ceiling fans, indoor & outdoor motorized shades, surround sound, access to cable TV & high-speed Internet, satellite dish, security system, auto timed front & back yard watering system, and private streets.